FULL TIMEThe final siren sounds with Hawthorn defeating Collingwood by 65 points. 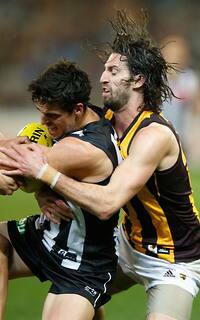 Hawthorn look forward to a finals campaign whilst it's all over for Collingwood in 2014. GOAL MAGPIESPendlebury handballs inside to Blair who squeezes the kick off the tight angle and over the head of Hale. That is called a consolation goal. GOAL HAWKSLumumba tries to run it out of defence, but he is tackled by Puopolo and that's holding the ball. Puopolo takes care of business and kicks the goal. Josh Gibson is the leading disposal gatherer with a career best 36 for Hawthorn. Luke Ball with 19 possessions in his last match for Collingwood. BEHIND HAWKSHale is unable to take the mark, but it goes to Roughead who snaps, but misses to the right. BEHIND HAWKSGunston tries to mark Langford's snap for goal but it bounces off his chest and it's through for a behind. BEHIND HAWKSLewis' kick for goal looks good off the boot, but Seedsman juggles it over for a rushed behind. Magpies InterchangeSam Dwyer and is possibly out for the game. Collingwood's run of 8 consecutive finals appearances comes to an end tonight. A mixture of injury and form has seen their season unravel. GOAL MAGPIESBroomhead runs deep in attack to take the footy under pressure. He squeezes the kick out an d it's all good. He doesn't celebrate and jogs back to his spot. GOAL HAWKSDavid Hale has stood up in the second half and he presents once again to kick his second goal for the night. All of the big men for Hawthorn have had a good game. Hawthorn will gain some serious percentage from this win tonight, but not enough to displace the Swans. GOAL MAGPIESFinally, something for Magpies fans to celebrate with the ever reliable Steele Sidebottom as cool a a cucumber kicking the goal. Luke Ball is playing his last quarter in the AFL after a highly distinguished career that saw him win a premiership medallion with Collingwood. GOAL HAWKSHale has been good for the Hawks tonight and he finds Gunston again. Gunston goes back and kicks the goal. As easy as you like ladies and gentlemen! Hawks InterchangeBrian Lake off due to an injury. Magpies InterchangeSteele Sidebottom off due to an injury. Welcome to MCG for the Collingwood v Hawthorn Round 23 clash. 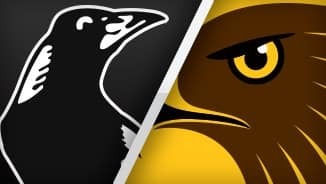 HAWTHORN has tuned up for its premiership defence in brilliant fashion and ended Collingwood's season with a 65-point win at the MCG on Friday night. It was a match that lacked spark and pressure for long periods, but the Hawks did what they needed to before finishing in style to win 18.13 (121) to 8.8 (56). The result all but seals a qualifying final between Hawthorn and Geelong next week, assuming the Cats beat the Brisbane Lions at Skilled Stadium on Saturday night as expected. Hawthorn could still finish on top of the ladder if Richmond beats the Sydney Swans by about five goals at ANZ Stadium on Saturday, dropping the Swans to second while securing the last finals spot. Collingwood's loss keeps the Tigers, Adelaide, West Coast and Gold Coast in the hunt for the final spot in the top eight. In a scare for the Hawks, key defender Brian Lake limped from the ground in the third quarter with an apparent right hip injury, and he was substituted at the final break. The Norm Smith medallist was bumped by Jesse White late in the third quarter, but said post-match the injury was just a corked hip. Midfielder Brad Hill was also a late withdrawal 90 minutes before the match with a corked quad, but Hawthorn otherwise finished the match with a clean bill of health. As they did against Geelong last week, the Hawks made a slow start and appeared to be in trouble, but they pulled themselves together and went on a devastating run after quarter time. By the end of the third quarter, with their spread and pinpoint ball use on full display, the Hawks had kicked 10 of the last 12 goals to lead by 43 points. They raced to the finish line to notch their seventh consecutive win against the Magpies, and their biggest win since round seven. 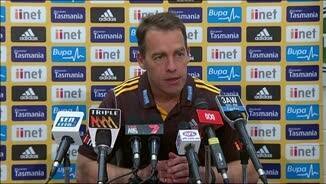 Coach Alastair Clarkson said his side had expected the Magpies to come out strong with their season on the line. "A lot of people in the footy community perhaps forgot that had Collingwood won, they could have still finished in eighth position," he said. 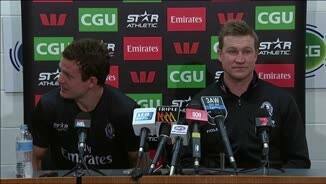 "That didn't surprise us, the endeavour that the Collingwood side had early in the game. It was just a matter of trying to withstand that pressure. "We knew that if we could just hang in there they'd be unable to probably go with us for the full four quarters." 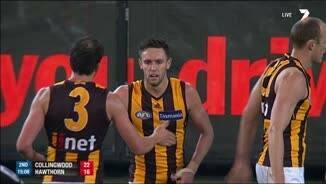 Hawthorn forward Jack Gunston kicked five goals, while midfielder Sam Mitchell (30 possessions and 10 clearances) and Brownlow Medal hopeful Jordan Lewis (33 and 11 marks) – who could snare a crucial three votes – drove the midfield. Josh Gibson had a career-best 36 possessions for the Hawks and added 11 marks, while Jarryd Roughead showed his class with four goals. The battle to lead the Hawks' ruck division in the finals is probably alive after Jonathon Ceglar finished with 11 possessions, 15 hit-outs and one goal. Ben McEvoy will have the chance to press his claims in Box Hill's VFL final against Port Melbourne on Saturday. For Collingwood, which was already decimated by injuries to key players, it was midfielder Steele Sidebottom (36 possessions and nine clearances) captain Scott Pendlebury (28) who battled hardest. The injury-ravaged Magpies missed the finals for the first time since 2005, and finished the season with an 11-11 record after winning eight of their first 11 matches. In his final AFL game, premiership midfielder Luke Ball (21 possessions) was tireless to the final siren, and the 223-game veteran walked off the ground with a guard of honour from both teams. Debutant Corey Gault showed positive signs in kicking two goals, including a 30-metre effort off the ground in the second quarter. Coach Nathan Buckley saw positives in the performances of his young players, but acknowledged that a gap in class and experience was ultimately decisive. "Lambs to the slaughter comes to mind a little bit," he said. "We came with good intent and we executed our plans pretty well early … we just weren’t clean enough to take advantage. "As the game wore on, the Hawks' legs were telling against us and it just looked like we didn’t have anything under us. In the end, the result looked after itself." The Hawks were well off their game in the opening term, and might have been contemplating avoiding injury at all cost with so little to gain. The Magpies, meanwhile, had everything to play for with their finals flame flickering, and they threw their best at the reigning premiers for 30 minutes. But with an average of just 66 games' experience – compared to the Hawks' 118 – the tide was always going to turn. It did in the second quarter, with Mitchell and Lewis asserting themselves in the midfield, while Roughead and Gunston combined for five goals in the term. Roughead finished with four goals, leaving him five short of former Hawthorn's teammate and Coleman Medal leader Lance Franklin (67). 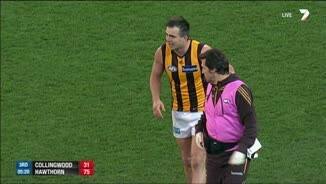 An injury scare for Brian Lake took some of the shine off Hawthorn's big win. 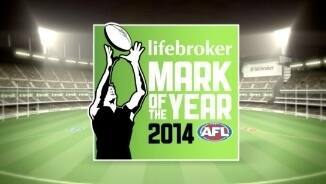 Picture: AFL Media.